Breaking from my training schedule, I headed out for a 7am start on the Riverplace Nature Trail. Andres had already completed the first of his planned 4 out-and-backs on the nearly 6-mile-long trail. I was out for a shorter 16 mile session so Andres (who is training for a series of ultras culminating in the Rocky Raccoon 100 Miler in February) already had over an hour of hard running completed when I joined him. Despite the relative break in the heat, with highs down from 105+ over the last week, it was already in the 80s and super humid by 7am. By the end of the run it was in the mid-90s. I’ve done very little training in the heat so far in 2011 so it took a lot out of me, as did the terrain. From what I’ve read, the round-trip for the trail sees about 3000 feet of elevation change. 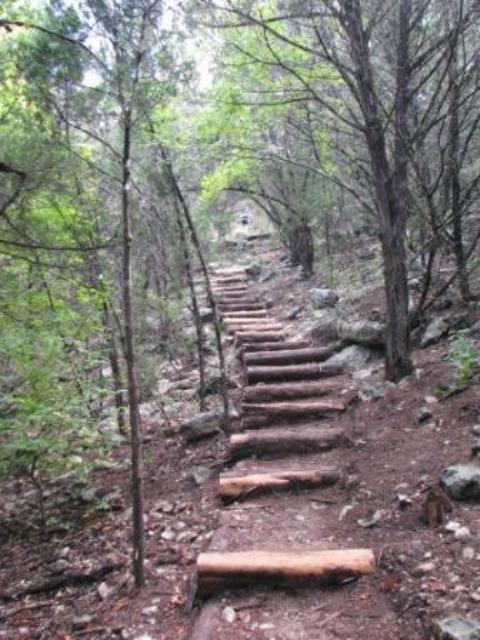 I don’t know how accurate that it but it is almost always going up or down, usually with logs creating steep and sometimes winding stairs right across the hills and ridges, with large stones spanning the (currently bone dry) creek beds. Between the heat and the constant climbing and descending, our pace was slow. Very slow. I don’t typically stop my watch for breaks (to pee, refuel, adjust this and that) but still the total elapsed total time we were together seems ridiculously long. I totaled right about 17M on my Garmin, though it may have been marginally longer since the GPS sometimes cuts the distance across a switchback. Either way, over 4 hours for 17 miles seems absurd but it felt like the effort of an easy marathon on a cool day. 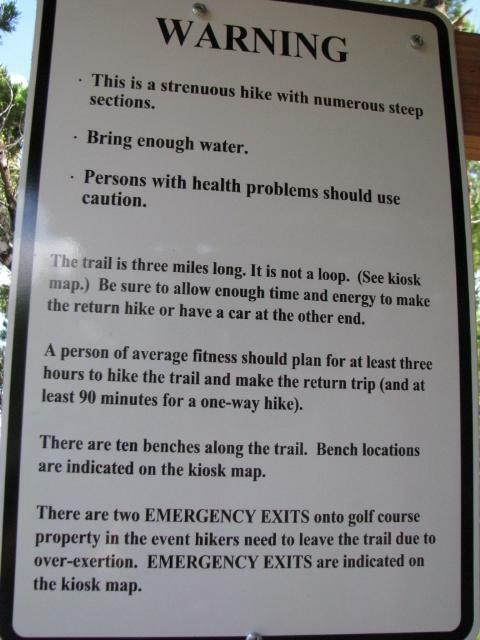 The trail sign says a single round trip hike for “a person of average fitness” should take about 3 hours so doing 3 such trips – in sauna-like weather – in 4 hours allows for some perspective. It really is a beautiful and interesting trail. Last time out there we saw a coyote about 20 feet away (that’s really close for a coyote) and today I ran across a snake. By that I mean to say that I ran directly over a snake – bottom of shoe directly across its back with my full weight. I didn’t even notice but I did see it slither away after Andres pointed it out. Here’s another photo that gives some sense of the endless look of the stairs. It is like this for miles in both directions, with more runnable stretches linking them up. At about end of the third “out,” roughly 14 miles in for me, we decided to pop out into the neighborhood, as we were overheating and running low on water (which we had been replenishing at our cars at the other end of the trail). With 3 hard miles left and the heat and fatigue, we wisely opted to venture forth into Riverplace (an upscale neighborhood where sweaty, dirty, shirtless guys may or may not be appreciated walking up to front doors unannounced) in seek of a hose. No answer at the first house was as good as permission so we hosed down, refilled, and were on our way back. Andres was dealing with leg cramps (it is really hard to get enough salt and hydration in those conditions and he had been running for an hour longer than me) but we continued to push the pace on the final return of the morning. He did great and I felt reasonably good, though I’m not sure that would have been the case with another 6 miles on my legs at that point. We ran it in pretty hard with something that felt like (but wasn’t much of) a sprint to the cars. Other than being generally worn out and dehydrated, it was a good training run. Perhaps a bit more than might be ideal for this point in my marathon build-up but it is always good suffering with a friend. After a recovery shake, nap, and an avocado-and-eggs-on-sprouted-grain-bread-with-salsa-special, I found the energy to crank out the pushing and pulling of the day. And do dishes, laundry, get in some legitimate work, swim with Sagan, and get dinner started. Good times.